Icom IC-7300: Field Day reports? I’m curious: any Post readers use the new Icom IC-7300 on Field Day? While I gave Icom’s new transceiver a very positive review, it was based on operation at my home QTH. There were no significant contests in progress during my review window. Field Day has, arguably, some of the toughest receiver conditions out there. If a transceiver/receiver performs well during Field Day’s dense signal environment, without overloading or distorting, it’s a good receiver. I’m very curious if anyone tested the IC-7300. I assume someone took it out to play on Field Day! Please consider commenting with your report! 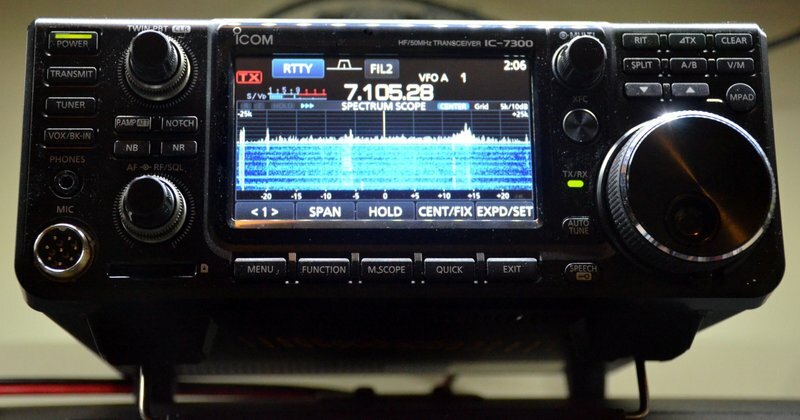 This entry was posted in Articles, Ham Radio, News and tagged Amateur Radio, Field Day, General Coverage Transceivers, Ham Radio, IC-7300, Icom, Icom IC-7300 on June 29, 2016 by Thomas. I heard the display gets washed out in the sun, menus make changing features on the fly cumbersome and is not considered to be contest grade. I participated in ARRL Field Day this year with a club located in Southeastern Ohio. We used the Icom IC – 7300 as our only radio on HF. So I can’t comment on any problems the radio might have had in handling RF energy generated by other HF transceivers at the same site. A little background on Field Day. Hundreds of radios are activated across North America on Saturday afternoon. The number of active radios tends to thin out as the event continues into the late hours of Saturday night. From that point until the end of the event on Sunday afternoon the RF environment is not as strongly energized as during those first hours on Saturday. Ohio is in a section of the United States where the RF field is strongly energized by signals in the ham bands during the event. We experienced significant compression of received signals on all the HF bands on which we were operating the IC – 7300 during the first 9 hours of the event. This is probably the result of intermodulation distortion originating from reciprocal mixing products of strong adjacent frequency signals appearing in the passband of the receiver. To the listener it produces distorted audio with gain compression. This condition was present on both SSB and CW signals. The distortion was more severe on SSB than CW. We attempted to correct the RMIMD problem by reducing the RF gain, inserting attenuation and turning on the Intercept Point Plus function. None of these helped much. The many features that make easily and quickly changing parameters and functions that the IC – 7300 offers should suit themselves well for using this radio for events involving less RF intensive environments. What kind of an antenna? Was a “transmatch” used? Antennas were inverted vee dipoles. An auto-tuner was used. That would help with out of band signals getting into the front end. Any un-tuned 1/4 wave resonant antenna has poor rejection and a tuner sometimes will knock down IMD problems. In the old days, superheterodyne radios with good rf front ends generally handled overload better especially considering the 80 meter second harmonic was on 40 meters and so fourth 20, 15 10 meters. Transmitters have (minor leakage) of harmonics that can still cause problems. The SDR’s are still too new and true field testing will separate the eagles from the turkeys. I would be interesting on how it handles adjacent signal overload in the front end. Most SDR’s don’t have tuned front ends.